Typical Coin Show Bourse Floor. Image Copyright: © 2015 James Bucki; All rights reserved. Coin shows are a lot of fun! Where else can you visit the equivalent of 40 or more coin dealers in a single day? A palpable energy seems to electrify the bourse floor of a large at well attended coin shows, as people from all over the world negotiate the buying and selling of rare and wonderful coins! 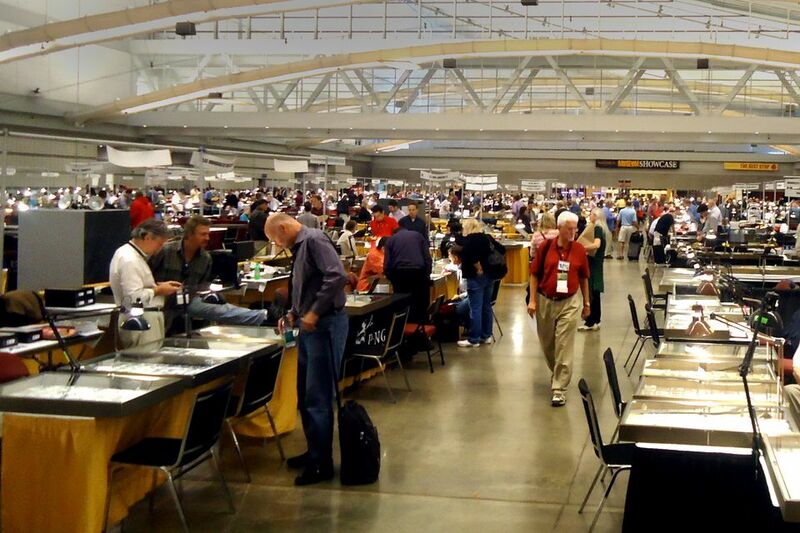 The coin show environment, as exciting as it can be, can also be intimidating to a first-time coin show attendee. Even some long-time coin show fans regularly break the rules of etiquette and courtesy at coin shows, by doing things that aren't "dealer friendly." Follow these guidelines, and you will have a most enjoyable experience where dealers and collectors alike will share their knowledge and passion for coins with you. Coin show dealers often bring their best merchandise to coin shows, since they will have an opportunity to interact with other dealers and lots of customers who might be looking to buy the coins they are trying to sell. Since the offerings at a coin show usually represent the very best stock that dealers have, they are understandably more nervous about potential losses to that merchandise. Therefore, one of the most important things you, as a customer, must always keep in mind is making the dealer comfortable that you are not out to steal his prized possessions. Remember, the coin inventory that is in front of you is the coin dealer's livelihood. It doesn't matter if it is worth thousands of dollars or millions of dollars, he will be very protective of it. Take your time, be patient, and most importantly follow the rules of etiquette for a most enjoyable experience at a coin show. Keep bags, purses, satchels, and other containers away from the table. If you are standing at a coin show dealer's table and looking through boxes or trays of coins, keep your bags to your backside, either on your shoulder swung around back, or way up on your arms, so your hands and lower arms are free and open to view. The point is that you want the dealer to feel comfortable that you are not slipping coins into your purse or satchel. If you sit down at the coin dealer's table, never put your purse or bags in your lap! Always place them on the back of your chair, if possible, or on the floor beneath your chair. Avoid putting bags on the floor between your legs, because the "peek and drop" is probably one of the most common ways that dealers lose coins at coin shows. (The thief takes the coin in hand, and at an opportune moment lets it drop down into his lap or between his legs into his bag.) Always put yourself in the dealer's place, and try to see how you would perceive someone's actions if you were at his side of the table. At coin shows, be cognizant of where you take coins from, especially from fixed-price boxes. Sometimes coin show dealers put out boxes or trays of coins that have a fixed price on them. If you shop from these boxes, only look at one price group at a time, and then set those picks aside or have the dealer bag them up for you, so that you don't get merchandise from different priced boxes mixed up. Always pay attention to where you took a coin from, so that you can be sure to replace it in the proper box or tray if you don't end up buying it. Not only is this just common courtesy to the dealer, but you save future customers some aggravation, too. There's nothing more disheartening than finding a $40 coin in the $5 pick box, only to learn that it should have been in the $40 box and some previous customer had misplaced it. This puts both the dealer and the customer an awkward position! So think about this when you buy from pick boxes. Also, if you find a die variety, error coin or other rare coin in a "junk box" do not embarrass yourself and the dealer by pointing out to other people that the dealer doesn't know what he has. This is a sure way to alienate yourself from a dealer that can provide valuable information to you in the future. Keep your books and checklists away from the coins. Coin show dealers usually aren't too thrilled to see customers pulling out books and checklists while they shop for coins. If you're a "checklist" type of person, keep the dealer's perspective in mind. Books and papers are really good places to slip a coin or two, and many dealers have lost coins this way, so always bring the minimum amount of paper onto the table. Keep the coins you pull out very separate from your reference material; don't let any coins get near your paper stuff. Don't keep your papers in your lap, though, because nothing looks more suspicious to a coin show dealer than a customer who is constantly bringing his hands from the boxes and coin trays down into his lap. Keep the papers on the table, but off to one side. If the dealer's table gets busy, and you know you're likely to be a small customer for him, step away for a few minutes so others can have a look and move on. If you've pulled some coins you want to buy, ask the dealer to hold onto them for you for a bit. Never step away from a coin show dealer's table with unpaid for coins, even for a moment! This can get you thrown out of a coin show if the dealer thinks you were trying to steal his coins. As in all things, communication is key. Always be aware of what your hands are doing when you're at a coin show. One thing I'm still doing is forgetting to take my loupe (magnifier) out before the show. Thus, the first dealer I get to where I want to examine some coins up close, I find I need to dig into my purse to find my loupe. I am always careful to set down the coin I am holding, (and I'm never holding more than one at a time, another good rule to follow), and then I turn my hands palms up as I pull them away towards my purse. By turning my hands palms up, the dealer knows I haven't palmed anything. I also verbally announce that I am getting my loupe, so he knows what's going on. These actions pass casually, and nobody takes any notice notably, except that the dealer has a "good feeling" about me since he knows by my actions that I have a great deal of respect for his position on the other side of the table. Most coin show courtesy is merely common sense. Bring cash with you, since many dealers don't take credit cards, especially for bullion coins. Don't ask dealers to hold coins you know you aren't going to buy. Don't monopolize the "junk boxes." Wait your turn for service. Only handle coins and slabs by the edges! And remember to have a good time looking at all the great coins! There are many coin shows around the country every weekend. A few times a year major cities host national coin shows where dealers, large and small, from across the country come to sell their coins. However, most coin shows are small to medium-size (50 coin dealers or less) and run on a regular schedule throughout the year. First, you can search the Internet for coin shows near you. Additionally, you may want to find a local coin dealer and inquire if there is a coin show in the near future. Most coin dealers that have a store, also participate in local coin shows. They would be your best resource to find a coin show near you.